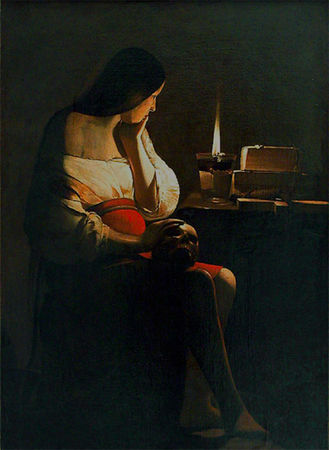 Georges de La Tour, Penitent Magdalene, oil on canvas. Musee du Louvre. 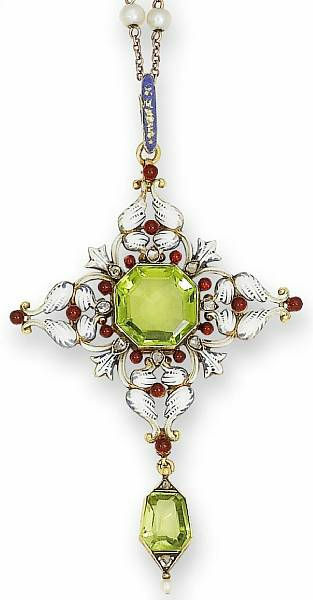 Acquired in 1949. MADRID.- Through the program “Guest Work of Art”, the Museo del Prado inaugurates a new exhibition model that pretends to allow visitors to get closer to great Works of art from other museums with the double objective of enriching the visitor´s experience and to estbalish a comparative term that allows reflection on the museum´s own works of art. The work of art selected to open the program, The Penitent Magdalene by Georges de la Tour, presents Magdalene, symbol of redemption through repentance, in a night scene, illuminated by a candle that creates violent contrasts in her meditation instruments, the sacred books, the cross and the Skull, symbol of death, objects that conform one of the most beautiful still lifes made by the author. La Tour shows the saint with a delicate aspect, far away from her common laborers, soldiers or street musicians. The Museo del Prado exhibits two other works by Georges de La Tour, the only ones that exist in Spain: Blind Musician (c. 1620-30) and Saint Jerome Reading (c. 1627-29). Both illustrate the essential characteristics of the daylight paintings by La Tour, an artist who was a specialist in genre and religious scenes, with popular characters in both cases, represented in daily circumstances. His characters seem to be taken out of the natural, with neutral backgrounds and simple geometry. 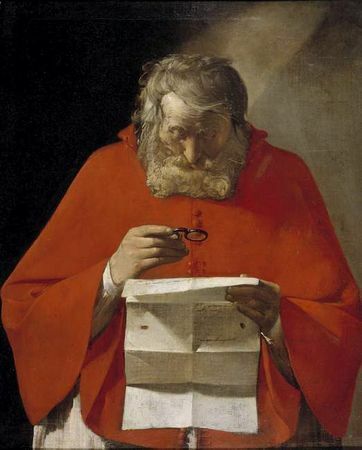 Georges de La Tour (March 13, 1593, Vic-sur-Seille – January 30, 1652, Lunéville) was a painter, who spent most of his working life in the Duchy of Lorraine, which became part of France the year before his death. He painted mostly religious scenes lit by candlelight, and after centuries of posthumous obscurity became one of the most highly regarded of French 17th century artists in the 20th century. Georges de La Tour was born in the town of Vic-sur-Seille in the Diocese of Metz, technically part of the Holy Roman Empire, but controlled by France after 1552. Baptism documentation reveal that he was the son of Jean de La Tour, a baker and Sybille de La Tour, née Molian. It has been suggested that Sybille came from a partly noble family. 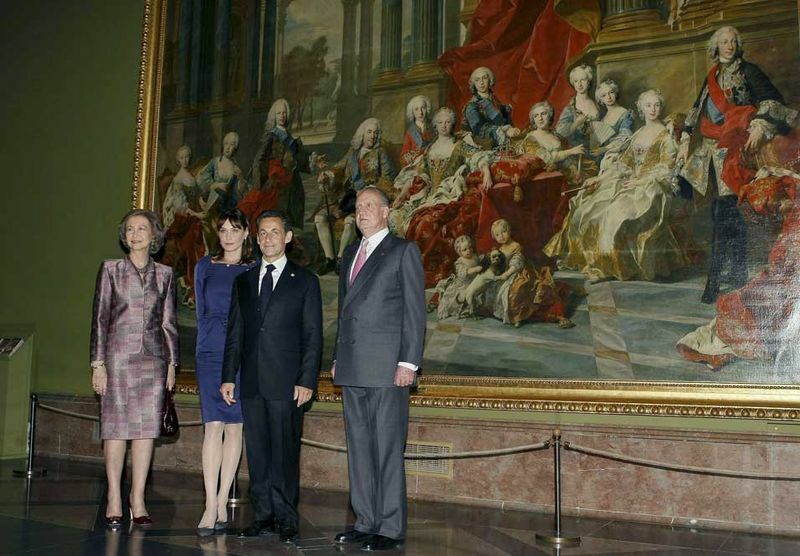 His parents had seven children in all, with Georges being the second-born. La Tour's educational background remains somewhat unclear, but it is assumed that he travelled either to Italy or the Netherlands early in his career. His paintings reflect the Baroque naturalism of Caravaggio, but this probably reached him through the Dutch Caravaggisti of the Utrecht School and other Northern (French and Dutch) contemporaries. In particular, La Tour is often compared to the Dutch painter Hendrick Terbrugghen. In 1617 he married Diane Le Nerf, from a minor noble family, and in 1620 he established his studio in her quiet provincial home-town of Lunéville, part of the independent Duchy of Lorraine which was absorbed into France, during his lifetime, in 1641. He painted mainly religious and some genre scenes. He was given the title "Painter to the King" (of France) in 1638, and he also worked for the Dukes of Lorraine in 1623–4, but the local bourgeoisie provided his main market, and he achieved a certain affluence. He is not recorded in Lunéville in 1639–42, and may have travelled again; Anthony Blunt detected the influence of Gerrit van Honthorst in his paintings after this point. He was involved in a Franciscan-led religious revival in Lorraine, and over the course of his career he moved to painting almost entirely religious subjects, but in treatments with influence from genre painting. 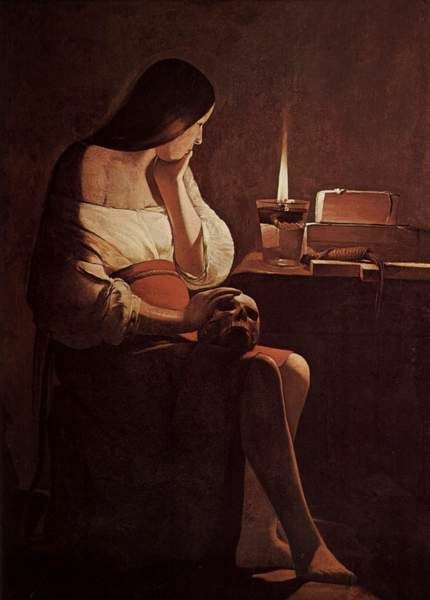 Georges de la Tour and his family died in 1652 in an epidemic in Lunéville. His son Étienne (b. 1621) was his pupil. His early work shows influences from Caravaggio, probably via his Dutch followers, and the genre scenes of cheats—as in The Fortune Teller —and fighting beggars clearly derive from the Dutch Caravaggisti, and probably also his fellow-Lorrainer, Jacques Bellange. These are believed to date from relatively early in his career. La Tour is best known for the nocturnal light effects which he developed much further than his artistic predecessors had done, and transferred their use in the genre subjects in the paintings of the Dutch Caravaggisti to religious painting in his. Unlike Caravaggio his religious paintings lack dramatic effects. He painted these in a second phase of his style, perhaps beginning in the 1640s, using chiaroscuro, careful geometrical compositions, and very simplified painting of forms. His work moves during his career towards greater simplicity and stillness — taking from Caravaggio very different qualities than Jusepe de Ribera and his Tenebrist followers did. He often painted several variations on the same subjects, and his surviving output is relatively small. His son Étienne was his pupil, and distinguishing between their work in versions of La Tour's compositions is difficult. The version of the Education of the Virgin, in the Frick Collection in New York is an example, as the Museum itself admits. 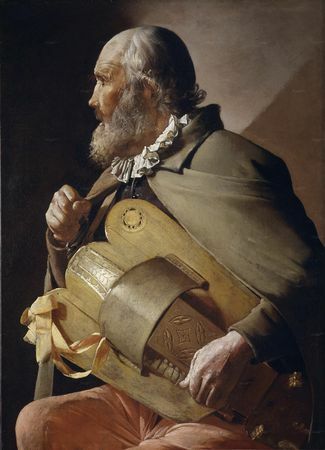 Another group of paintings, of great skill but claimed to be different in style to those of La Tour, have been attributed to an unknown "Hurdy-gurdy Master". All show older male figures (one group in Malibu includes a female), mostly solitary, either beggars or saints. 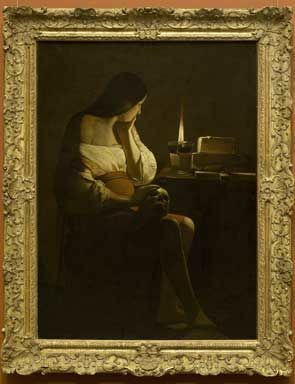 After his death in 1652, La Tour's work was forgotten until rediscovered by Hermann Voss, a German scholar, in 1915; some of La Tour's work had in fact been confused with Vermeer, when the Dutch artist underwent his own rediscovery in the nineteenth century. In 1935 an exhibition in Paris began the revival in interest among a wider public. In the twentieth century a number of his works were identified once more, and forgers tried to help meet the new demand; many aspects of his œuvre remain controversial among art historians. George de La Tour, Madeleine repentie (ou à la veilleuse), 1630/35, Huile sur toile, 128 x 94 cm. Musée du Louvre, Paris.